It all started when I was ready to start my day with some protein, I opened the fridge to find fresh brown eggs. Geisla, a church lady friend, had sent some farm fresh eggs home with my husband. Now that the Coles have moved away, we are next in line to get eggs regularly (nice). Look at these delicious beauties – and Geisla likes to share little pages from her inspirational booklets. This is special to us because my husband’s grandma T. (RIP) used to send us little ripped out pages of inspiring stuff too. Looking down at this large, spotted farm fresh egg. I decided to wake the house with the smell of sizzling eggs. To help carry the protein, I pulled out some “brown rice bread” – from Trader Joes. The loaves are very heavy – like a brick- and it takes forever to toast a piece because it is so dense. The taste of brown rice bread is smooth and not too bad. Even though it is not my favorite bread in the world, I am grateful for it because it is gluten-free and does not interfere with the “slow going” systemic cleanse I am doing – so that makes it win-win. Here are the three salts we tried (all were under six dollars from Marshalls). 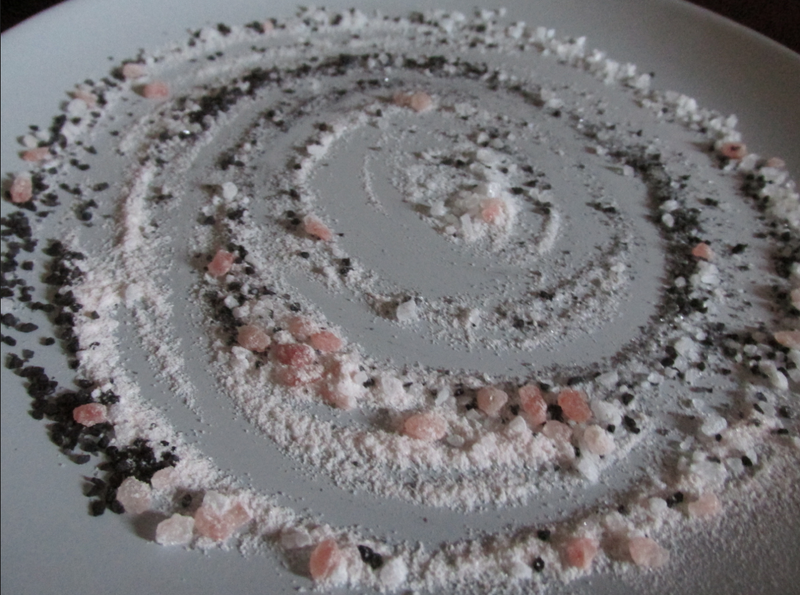 I arranged the 3 salts to show you their packages (linked to Thursday Special) – (A)Italian iodized white Sea Salt , (B) Hawaiian Hiwa Kai black sea salt, and (C)Himalayan pink crystal mountain sea salt. This was my first sea salt taste test – and so I kept it simple. I ground all the salt down to a medium fine powder. Four of us agreed the pink one was the best -(here) but keep in mind this was tested on eggs that were fried with olive oil. The outcomes might not be the same if we used butter or coconut oil. Also, the results would likely be different if sampled on meats or different food items. One of the testers said the pink one was saltier than the white, and the black was saltiest of all. And someone else said (joking) they all just “tasted like NaCl” ha! In closing, if you want to know more about the health benefits of unrefined salt – check out empowered sustenance HERE. February 5, 2015 at ..
haha – that’s a deal! and there really is a difference from store bought and geisla’s fresh beauties.. Yes, I love country fresh eggs! yeah, not all eggs are equal that’s for sure! I will have even more craving then lol! wow – I did not make it to that tip. hm – but I do know that some people are told to just stop having salt when they have physical problems – (i.e. blood pressure probs) and what is sad about it is that instead of fixing any root causes or addressing the inner imbalances – people are put on meds and given a restricted diet – without getting to the root cause and without rebuilding a health body terrain – and so telling people to not eat unrefined salt is further adding to their probs because they get less magnesium. One size does not fit all for sure. I just try not to go overboard. 🙂 – and flavor can be so good – which is something I think people do not always realize – many times plain (salt-free) and fat-free is presented as healthier – when it is not necessarily…. That’s one of my biggest “things” about healthy food myths: healthy doesn’t have to be bland! And “free” doesn’t always mean better for you, healthy food can taste better than regular food, if you put some thinking into it. well keep in mind that sometimes when our body reacts badly to something – it does not always mean we should eliminate it forever – and while the topic can be lengthy – well sometimes we can ingest something that started a healing or cleaning process – but it will make us feel like crap (HERX effect) before it will lead to wellness. so for example, someone takes spirulina and gets tired, groggy and feels completely bad. they stop eating the spriulina and go back to “normal” – but that could be because the greens were starting a detox effect and it was helping them – (can be tiring to heal up and clean up) but many times we are too quick to assess. 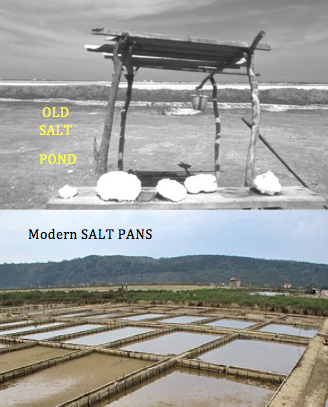 some people are highly “salt sensitive” because they have other things going on that need to repaired – they need to rebuild their immune system and clean out any microbes or build up of mucoid that is clogging their mucosa lining and other parts of the GI (which then stresses their adrenals and puts pressure on all systems) and so when they eat salt it makes their blood pressure spike – or puffs/swells them up – etc. and the thing that is so funny is that blood pressure is also spiked by fructose, processed food and stress – but you never hear docs saying “quit sugar” – quit boxed crap foods – but they will be quick to say go salt free. so when it comes to ingesting salt…. Such a detailed analysis of the varieties of salt. And in favoring the pink one you’re not absolute in its crowning, which I like, because the same salt, as you said, may taste different on a different dish. The eggs look fresh. A deliciously healthy post! February 7, 2015 at ..
Hi S – well that is funny about carrying that salt all the way there to have it there. one time my husband drove to Californian from Florida – and they did an inspection as he was going into California – it was Dec 2001 and they said they were having a big fruit fly problem – so they asked him if he had any produce (coming from Florida) and he reported that he might have a couple in the cooler – and opened it up – and the two oranges said “California Navel” – so he brought west coats oranges from the east coast back to the west coast! also, I guess the feather color of the hen determines the wheel color – (hens with white feathers = white-shells; hens with red-ish feathers = brown eggs). Your beautiful photography makes every day items look like works of art. Very, very impressive. The photo is perfection Yvette! Another reminder the art is all around …you just have to have the eyes to see it! I have never seen black salt before! I don’t think they sell it here in Europe..if they do, I might mistaken it to pepper! 🙂 Thank you for informative article Yvette! well thanks for dropping by Indah – and if you do try it let me know – we found that the black was very potent – but you know – it kinda did look like pepper too! Your salt photos are really eye catching. The eggs, in their shells, and bread are very appealing subjects. I rarely add salt to my food because when I eat out the food has more than enough salt in it. Is olive oil better than rice or canola oil for frying? Thanks for an interesting post with stunning photos. but I do know that the olive oil should be extra virgin good quality for it to be resistant to oxidative damage from cooking – also, butter and coconut oil are really good choices – (and peek here at MDA’s article on “ghee” (HERE) which is “blend of coconut oil and clarified butter” – or butter w/ milk solids removed – never tried it but sounds interesting). February 8, 2015 at ..
Why I asked about the oil, I was frying with olive oil and Pauline said to use rice. I am not too clued up on these things I just try to keep away from highly processed food. Thanks for communicating so well with your comments. thanks for your comment WG – the description was right from the label – and I will be very curious to hear about how you like the pink. I just think that the little things can add up – and a few trace minerals here and there sound good to me – and I cannot find it now – but I have heard of an amazing hydration drink that includes a tablespoon of sea salt – I wish I could find the recipe to share – but it replaces gatorade which is sugar laden with additives. if I find it I will post it here later. 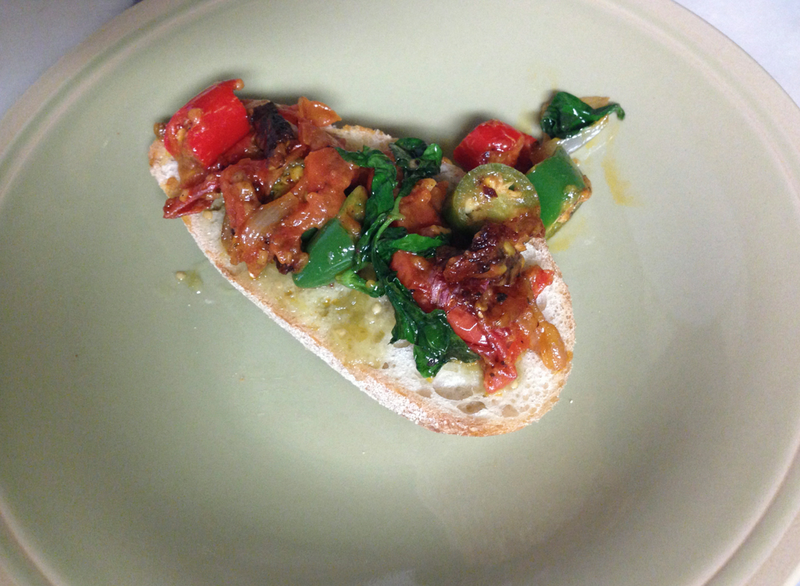 it has everything from my little container garden area: japs, tomatoes, basil, red peppers, parsley – and in this version I did a light sauté with butter – hint of fresh parm – served on trader joe’s penne bread – lightly toasted…. That looks amazingly delicious! I love that you grow everything yourself in containers! It goes to show how much we can grow for ourselves with a little planning and imagination. I bet that is hot and spice with the peppers 😉 And white wine? I was wishing I had not had breakfast while reading this and also did not know salt had those beneficial effect. I usually steer clear of added salt. February 9, 2015 at ..
Amy = I am very grateful for brown rice bread right now – it is very hearty – not bad tasting – and makes excellent toast – which then goes with anything – like eggs – or soup, etc. February 10, 2015 at ..